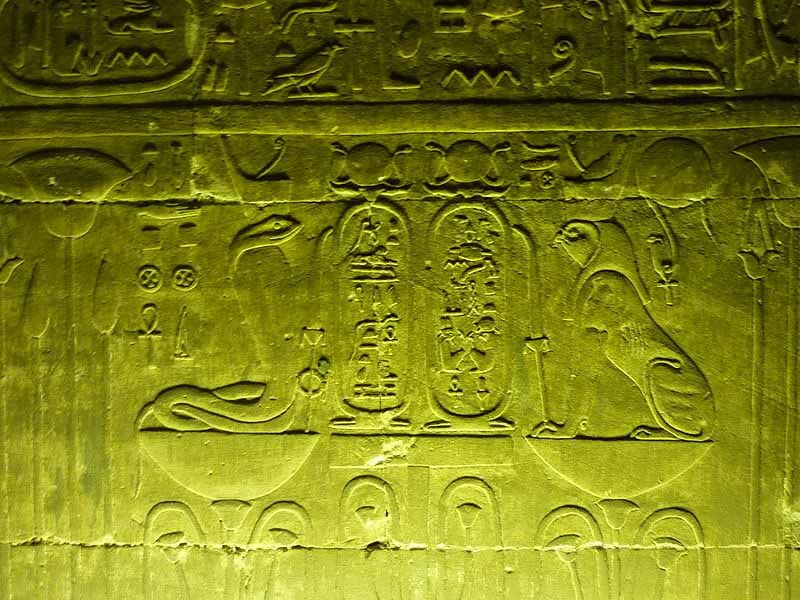 In Egyptian mythology, Wadjet, or the Green One (also spelled Wadjit, Wedjet, Uadjet or Ua Zit and in Greek, Udjo, Uto, Edjo, and Buto among other names), was originally the ancient local goddess of the city of Dep (Buto), which became part of the city that the Egyptians named Per-Wadjet, House of Wadjet, and the Greeks called Buto (Desouk now), a city that was an important site in the Predynastic era of Ancient Egypt and the cultural developments of the Paleolithic. She was said to be the patron and protector of Lower Egypt and upon unification with Upper Egypt, the joint protector and patron of all of Egypt with the "goddess" of Upper Egypt. 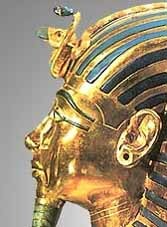 The image of Wadjet with the sun disk is called the uraeus, and it was the emblem on the crown of the rulers of Lower Egypt. She was also the protector of kings and of women in childbirth. As the patron goddess, she was associated with the land and depicted as a snake-headed woman or a snakeÑusually an Egyptian cobra, a poisonous snake common to the region; sometimes she was depicted as a woman with two snake heads and, at other times, a snake with a woman's head. Her oracle was in the renowned temple in Per-Wadjet that was dedicated to her worship and gave the city its name. This oracle may have been the source for the oracular tradition that spread to Greece from Egypt. Wadjet was closely associated in the Egyptian pantheon with Bast, the fierce goddess depicted as a lioness warrior and protector, as the sun goddess whose eye later became the eye of Horus, the eye of Ra, and as the Lady of Flame. The hieroglyph for her eye is shown below; sometimes two are shown in the sky of religious images. Per-Wadjet also contained a sanctuary of Horus, the child of the sun deity who would be interpreted to represent the pharaoh. Much later, Wadjet became associated with Isis as well as with many other deities. In the relief shown to the right, which is on the wall of the Hatshepsut Temple at Luxor, there are two images of Wadjet: one of her as the uraeus sun disk with her head through an ankh and another where she precedes a Horus hawk wearing the double crown of united Egypt, representing the pharaoh whom she protects. 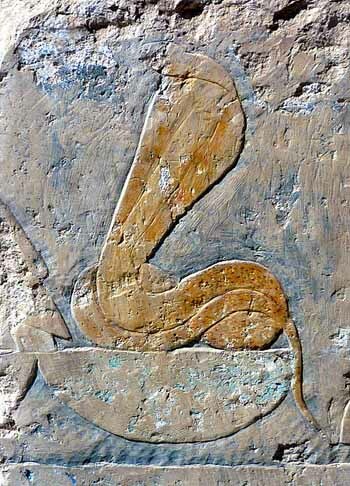 Wadjet is primarily a snake-headed protector of Lower Egypt - the delta region. However, the ancient people of northern area worshiped Wadjet as a vulture Goddess. Wadjet was revered as the goddess of childbirth, and protector of children, and in later years she became the protector of kings. WadjetÕs role was often seen as a forceful defender, while her sister, Nekhebet, was seen as the motherly defender. This contrast provided the counterpoint seen in many of the Egyptian deities. The symbol of justice, time, heaven and hell, Wadjet is one of the oldest Egyptian goddesses. Many Egyptian deities were associated with specific hours, days, and months, and Wadjet was no different. Her time was considered to be the fifth hour of the fifth day of the month, or lunar cycle. Interestingly enough, December 25th, on the Egyptian calendar, was considered to be the "going forth of the Goddess," while April 21st was her feast day. The many days when Wadjet is honored culminate during her month, Epipi, the harvest or summer month. This corresponds to mid-May through mid-June on the Gregorian calendar. 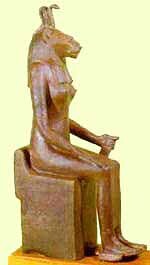 The goddess Wadjet appears in the form of the living Uraeus to anoint your head with her flames. She rises up on the left side of your head and she shines from the right side of your temples without speech; she rises up on your head during each and every hour of the day, even as she does for her father Ra, and through her the terror which you inspire in the spirits is increased ... she will never leave you, are of you strikes into the souls which are made perfect. In the modern world, Wadjet has once again surfaced as the goddess of an intriguing game that allows the players to explore ancient Egypt. The game is introduced, 'Your destination is the Valley of the Kings where you will experience a world of burning desert heat and blinding sandstorms. You will know the intrigue, the secrets, and the dangers that lie in every step through the dark corridors of the ancient tombs, as you search for the stolen treasures of the Pharaoh. But beware, the cobra goddess Wadjet has guarded the royal kings and their treasures for over 3000 years. She awaits your intrusion. 'Ê This interpretation of the goddess holds true to the images we see of her throughout ancient history.